Secession Art & Design is a creative atelier founded a few years ago by owner Eden Stein. For many moons, Secession was located on Bernal’s stretch of Mission Street, just across from our Taoist Safeway. During that time, founder and owner/impresario Eden carved out a terrific niche for Session, seamlessly combining art, fashion, home decor, and resident-artist workshops to create a storefront that won four San Francisco Bay Guardian “Best of the Bay” awards for Best Art Gallery (before the SFBG itself disappeared). Eden also became a core member of the Mission Bernal Merchant Association. Then Secession’a landlord decided not to renew the lease. After much scrambling, negotiating, and anxiety, Eden managed to find an even better space just a few blocks north — and still in Bernal! !— inside the former SoCha Cafe/former Dell’uva Wine Bar location at 3235 Mission @ Valencia. Then came the stressful renovation, and redecorating, and rethinking. 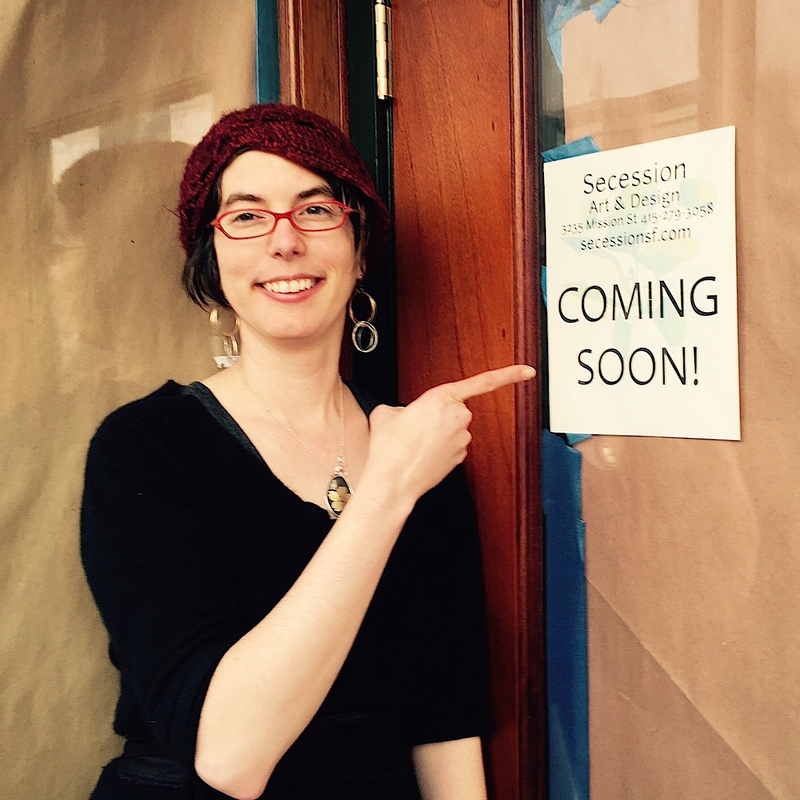 And now, finally, Secession Art & Design is ready for its grand re-opening: Tomorrow, Thursday, Feb 5, at 6:30 pm. 3235 Mission is officially open on Thursday, February 5. Join us 6:30-9:30pm for a welcoming party and thank-you to everyone who helped us dream big. Celebrate with us with champagne – cheers to new beginnings! Our new gallery and boutique has 30 feet of clothing, a showcase of locally-made jewelry, and over 250 pieces of art hung. Our current art collection features Silvi Alcivar, Shannon Weber, Hilary Williams, Melissa Wagner, Rachel Znerold, Heather Robinson, Rob Sakovich, Faern, Bughouse, Mark Brunner, Andrzej Michael Karwacki, Victoria Veedell and Nate 1. Our doors closed at our old location last Christmas Eve. I thought we would quickly be able to re-open, but opening a new location in San Francisco requires time, patience and jumping through a lot of hoops. My team has met every challenge, and we kept our heads high when inspections went south. We passed plumbing and electrical on Friday, and passed our final inspection Monday with flying colors. We spent the month of January perfecting the look of the store while we waited for the city of San Francisco to let us open. So much fun, and I’m thankful to have a contractor who could make every whim a reality. This truly is my dream store, and I look forward to reconnection. Our new gallery and boutique will be open our regular hours, Tuesday through Sunday, noon to 7pm, starting on Friday, February 6.